Give me clutter and I’ll purge like it’s my business. But cleaning, that’s another story. Now I do enjoy having a clean home, but spending hours cleaning is not my definition of fun. 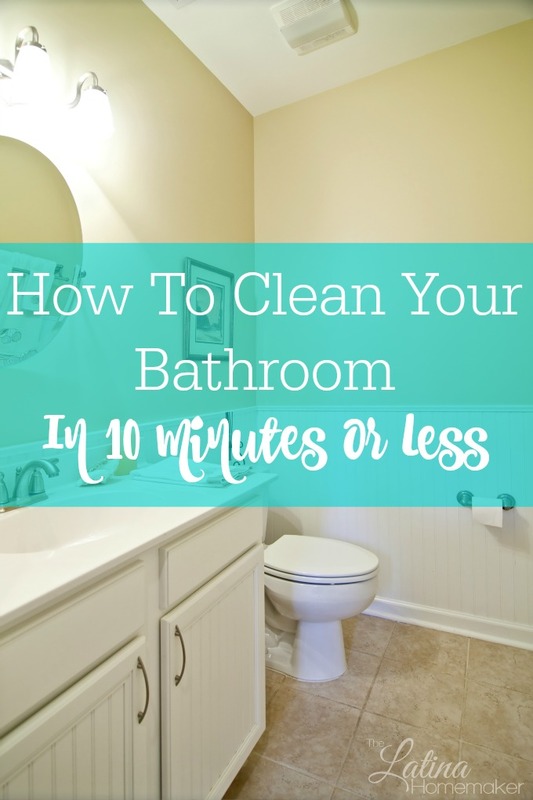 I’ve been using this method to clean my bathroom for a long time and it’s a great way to keep it clean without having to devote a huge chunk of time to the space. I do have days when I deep clean our bathroom, but this method is perfect for those in-between cleanings or when you’re tight on time. I do have a bathroom that is clutter-free which allows me focus on cleaning since I don’t have to put stuff away. I also empty our trashcan regularly and keep our toilet paper basket stocked, so I never have to add those to my to-do list. Start by spraying the outside of the toilet with disinfectant from the top of the toilet to the base including the toilet seat. Let it sit. In the meantime, pour toilet bowl cleaner under the toilet rim and scrub. Wipe down the outside of the toilet, again from top to bottom. I like to use a paper towel since I can flush it once I’m done wiping (2 minutes). Next, spray your shower area with your choice of cleaning solution and let it sit. In the meantime, spray and wipe the bathroom mirror, counter, faucet and sink bowl (2 minutes). Go back to the shower area and use a cloth to wipe from top to bottom. Use a non-abrasive cleaning solution and non-scratch scrub to clean the tub or shower floor (3 minutes). Finish by using a microfiber cloth to wipe all faucets and handles to add shine. Sweep the floor and use a microfiber spray mop (or whatever you prefer) to finish (2-3 minutes). Do you have any bathroom cleaning tips? Please feel free to comment and share! *This post was originally shared on Parents for Latinas magazine. I cheat and vacuum my bathroom! While I haven’t done it in a while (shame on me), I normally try and do it while doing the rest of the vacuuming and it works out great (then again, most of what’s on our bathroom floor is pet hair anyway, so it makes sense, ha). Also, there’s an after-you-take-a-shower spray that I’ve been using and it has definitely made cleaning the shower easier. It cuts down on the soap scum build up and the hardest part left to do is scrub the shower bottom/floor!